Sometimes the most important things in life seem to be the things that you take for granted, like the kinds of T-shirts you have in your closet. Looking at someone's vast collection of "T"-shaped shirts can tell you a lot about them, sometimes better than they can tell you. For the gift giver, sometimes just knowing that the recipient can stuff themselves in an XL shirt is enough information to purchase a present that will actually get used, instead of that bread machine that always seems like a good idea but is still sitting in the box under the counter. 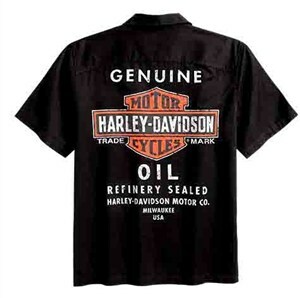 The Harley-Davidson Men's Short Sleeve Oil Can Garage Shirt may be a bit of a mouthful to say, but it's a quality T-shirt that will work great to soak up dirt and oil in the garage, or look good when you're walking around the neighborhood walking the dog. It's made out of 100% cotton twill and buttons up in the front. There are two chest pockets to hold various things (maybe a pen), and the screen printed Harley-Davidson logo on the front and back are a sure way to advertise your love of the brand. It's available in gray and black, and comes in a full range of sizes.